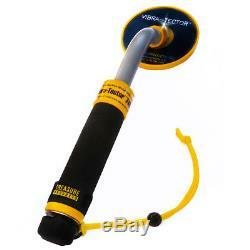 Treasure Products - Vibra-Tector 740 Pulse Induction Handheld Metal Detector. Carry Bags, Pouches & Covers. The Vibra-Tector 740 is our latest revised state of the art handheld metal detector. It incorporates new firmware algorithms to help find your target fast, and retain all the previous models advanced features which include. Communicates with vibration and light. Waterproof - Submersible up to 100 feet (30 meters). The Vibra-Tector communicates to the user with pulses of vibration and bright light. The unique sealed design is waterproof to a depth of 100 feet and the self calibrating microprocessor controlled circuitry requires no adjustments of any kind. The Vibra-Tector incorporates Pulse Induction (PI) technology. This allows hunting in any environment including grass, mud, dirt, sand, black sand, and fresh or salt water. The 4 coil and overall compact size makes the Vibra-Tector perfect for travel. It's a great all around metal detector for diving, snorkeling, or searching small areas. It has no push buttons that can break, but instead features our unique tilt-on / tilt-off design that allows unlimited detecting in any environment. Also includes an adjustable, and removable, wrist strap for added security. Communicates with vibration & light When a target is located the Vibra-Tector 740 signals with pulses of vibration and flashes of bright L.
Pulse Induction (PI) This technology allows hunting at the beach in salt water or in any type of soil, including black sand. Detection depth stability Our latest advanced circuitry maintains the unit's detection distance throughout the life of the battery. Target distancing The pulses of vibration and light will continue to increase in quantity as the coil gets closer to the target. Automatic tuning The state of the art microprocessor controlled electronics requires no adjustments of any kind. Waterproof Unique sealed design can be used in almost any environment including fresh or salt water to a depth of 100 feet. This makes the Vibra-Tector an ideal tool for divers or the beach. Low battery indicator Built in low battery sensor alerts you when the battery is low and needs replacing. Tilt On & Off The Vibra-Tector uses our exclusive tilt on & off system that eliminates the need for fragile push button switches. Easy battery installation The standard nine-volt battery is quickly changed without tools. Simply rotate the rear knob and pull out the compression seal to access the battery compartment. Compact design Because of its small overall size, the Vibra-Tector is easy to carry and can fit in almost any small suitcase or backpack for travel. Solid construction The Vibra-Tector rugged sealed construction and stainless steel hardware are built to last. Belt ring & wrist strap Includes a belt ring to attach to any common belt clip as well as a wrist strap for added security. Overall Length : 17 inches (43 cm). Coil Diameter : 4 inches (10 cm). Weight : 1 lb (450 grams). Power : One standard 9v battery. Waterproof : Submersible to 100 feet (30 meters). Listings for USED Items / Auctions. You have nothing to lose! 3901 Bestech Road #100 Ypsilanti, MI 48197. The item "Treasure Products Vibra-Tector 740 Pulse Induction Handheld Metal Detector" is in sale since Thursday, May 14, 2015. This item is in the category "Business & Industrial\Test, Measurement & Inspection\Test Meters & Detectors\Metal Detectors". The seller is "serious_detecting" and is located in Ypsilanti, Michigan. This item can be shipped to United States, Canada, United Kingdom, Denmark, Romania, Slovakia, Czech republic, Finland, Hungary, Malta, Australia, Greece, Portugal, Cyprus, Slovenia, Japan, Sweden, South Korea, Indonesia, Taiwan, South africa, Belgium, France, Hong Kong, Ireland, Netherlands, Poland, Spain, Italy, Germany, Austria, Bahamas, Israel, Mexico, New Zealand, Philippines, Singapore, Switzerland, Norway, Saudi arabia, United arab emirates, Qatar, Kuwait, Malaysia, Brazil, Chile, Colombia, Costa rica, Dominican republic, Panama, Trinidad and tobago, Guatemala, El salvador, Honduras.